I Believe I’ve Read Somewhere that Your Book Deadline Is Being Made into a Movie? Could You Share About that? Chuck Norris approached me four years ago, asking me to come stay with him to talk about making a movie. He said Deadline had a great impact on him, and he really wanted to see it produced. Since then we’ve been with Chuck and Gena a number of times, in California and Texas, and they’ve come up to Oregon to our place, and we’ve developed a close relationship. (You should have seen the reactions when Chuck walked in with me to our home church where I used to be a pastor; our church is in Boring, Oregon. No joke, that’s the name of the town. Let’s just say celebrities don’t find their way to our church.) Chuck and Gena are sincere followers of Christ, looking for biblical counsel and seeking to grow and honor the Lord. 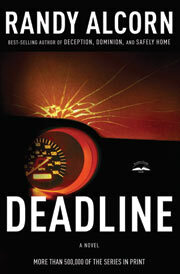 The screenplay for Deadline has been written, in fact by Jim Bell, who I mentioned. Chuck and Jim and I went over it together for three days, making revisions. It’s being shopped around right now. I don’t know if it will ever be made. I’ve thought God’s higher purpose was being able to invest in the Norrises. But if it is made, we are committed to make sure no one imports anything into the movie that would dishonor the Lord. If that might happen, I’m perfectly fine with the movie never being made.